I met Junior at San Francisco Animal Care and Control in 2001. It was the beginning of the year and Diane Whipple had just been tragically killed. All of the pit bulls at SFACC were being routinely killed because nobody wanted to adopt them. 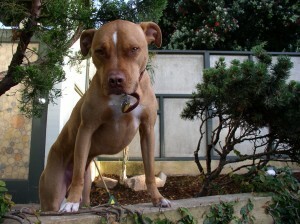 Junior was captured on the streets of San Francisco with his sister. They killed her and Junior was put up for adoption. Junior was an incredible dog. He had great issues with seperation anxiety and was trained for the four years we were lucky enough to know him. We created his own page, Junior’s Page, on this website. During the past year with all of the politics surrounding San Francisco’s breed specific SB861, the fear of pit bulls has been heightened once again. Good dogs like Junior are the ones who suffer. On the morning of Sunday, September 29, 2005, Junior was tragically hit and killed by a car on Highway One. We believe that he was intentionally hit and killed as there were no other cars on the road that lonely morning. We took the animals we had left and moved from California to a place that has no breed specific legislation. Not a day goes by that I do not mourn the loss of this wonderful dog who did not deserve to die such a young death. In the words of Ghandi, a society is defined by the way it treats its animals.